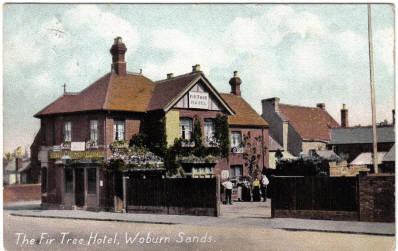 Looking into the history of it is main the reason that I began researching Woburn Sands history. I found it was the story of an inn with three different names, in two different locations, with one family involved in it for over 115 years. Above are links to what I have been able to find out so far. I have split the information into chapters to keep the pages smaller. I would be interested to hear if you are related to one of the past landlords, or have any old photos of the pub, particularly from the period 1920 – 1970. 5th Feb. 1779 Francis Lee1 1753 is the first reference to “The Shoulder of Mutton Inn” on the Woburn Road site. The name changed to “The Greyhound” in 1773. 5th Feb. 1779 1784 Mary Lee (Widow of Francis Lee1) Name changed to “The Fir Tree” in 1786. 1823 12th Mar. 1852 Francis Lee2 (Son of Edward Lee) The Inn transferred to the Aspley Hill corner site in 1838. 27th Aug. 1860 Jan 1868 Francis Lee3 (Son of Francis Lee2) Lee family made bankrupt, and sold the inn to Alfred Smith. 2nd Nov. 1871 1877 Jesse Cooper By 1872, Smith had leased it to Rogers and Bull of Newport Pagnell. They sold out to Allfrey and Lovell in 1875, also of Newport Pagnell. The next year they bought the freehold. 14th Dec. 1888 13th Dec. 1889 Walter Bailey The building we now know was erected on the site. 13th Dec. 1889 12th Sep. 1913 Benjamin Garrett Clubroom built in 1897. Allfrey and Lovell became The Newport Pagnell Brewery Company in 1900. 20th Apr. 1914 20th Jun. 1924 George Alexander The Newport Pagnell Brewery Co. was bought out and absorbed by Charles Wells, of Bedford, in 1919. 31st Jul. 1970 29th Oct. 1997 John Harvey Cox The clubroom was converted to hotel bedrooms in 1980. 3rd May 1999 Present Closed for refurbishment, then reopened by Kevin Brewer Major internal and external refurbishment and remodelling completed. Further refurbishment and remodelling in 2014. …*By the way, my girlfriend was obviously impressed with the efforts I made to find her an answer, as she married me!